Each year, the International Ice Hockey Federation honors girls and women’s hockey with its annual World Girls Hockey Weekend. 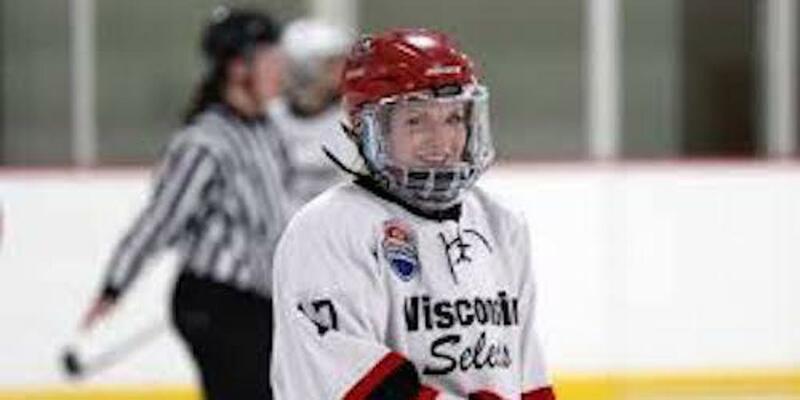 This year’s celebration, which took place Oct. 6-7, included more than 120 events across the United States, including two big ones in USA Hockey’s Atlantic District. 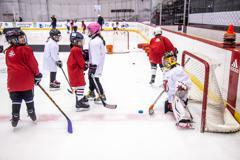 With the help of USA Hockey, the New Jersey Devils, the Philadelphia Flyers and others, the two events brought nearly 200 girls together to learn about and celebrate the sport. 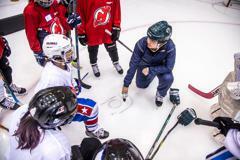 Kristen Wright, USA Hockey’s manager of girls player development, attended both events. 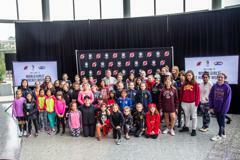 The Devils held their Girls Hockey Weekend activities on Saturday, Oct. 6, at the RWJ Barnabas Health Hockey House in Newark, New Jersey. About 80 girls, who were anywhere from 7 to 15 years old, participated. The day began with an hour-long speaking panel led by Wright. The panelists included two women, Erika Lawler and Kelly Nash, who have thrived in the sport and currently play for the Metropolitan Riveters of the National Women’s Hockey League. Lawler also played for Team USA at the 2010 Olympic Winter Games. The players, who helped the Riveters to an Isobel Cup championship in 2018, discussed player development, college hockey and how players can stay involved in the sport outside of playing, including coaching and officiating opportunities. “Having two players from the championship-winning team present was really cool for the girls to be able to see role models that they can look up to and ask questions to during the panel,” Wright said. Maureen Thompson-Siegel, who is the secretary for USA Hockey’s Atlantic affiliate, said there was plenty of interaction between the crowd and the panelists. One young girl drew a reaction when she asked Lawler about how she kept her hands warm on the ice. It was a light-hearted moment that brought everything into perspective. After the panel discussion, the players hit the ice in Newark. The skaters got plenty of fun and skill development during the 75-minute session, which included age-appropriate stations and games. 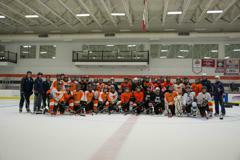 The Flyers held their Girls Hockey Weekend activities the following day in their practice facility, Skate Zone, in Voorhees, New Jersey. There were 100 participants ranging from 7 to 16 years old. The panel, again led by Wright, discussed the same topics as Newark. 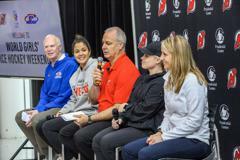 This was the first time the Atlantic District included panel discussions during Girls Hockey Weekend, an addition that participants enjoyed. “It allowed the girls to think a little about who they are and how they relate to the sport,” Thompson-Siegel said. 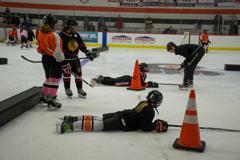 The Vorhees event included two separate on-ice clinics due to the large number of players. 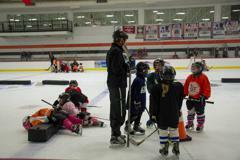 There was a session for girls 10-and-under and the one for the older skaters. Families traveled from as far as Delaware to participate. Along with all the hands-on instruction, the girls who skated got to take home souvenirs. The Flyers gave the players branded high-performance socks, and the Devils allowed the girls to keep the practice jerseys they wore during the clinic and also provided them with a drawstring bag filled with goodies. Wright and Thompson-Siegel are hoping the Devils and Flyers can support a similar event again next year.